Exporter means any person lawfully exporting goods from Bangladesh to any other country. 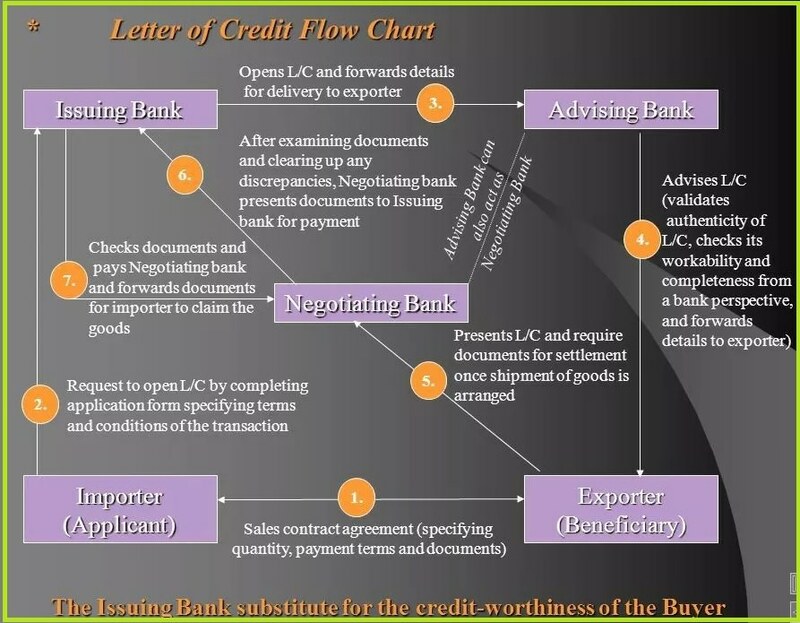 After shipment, the exporter has to tender the document to the bank within the stipulated period for the negotiation of the documents are drawn under a Letter of Credit. If require, finance the duty drawback and cash compensatory support claims of the exporter. Export credit means any credit provided by an institution to an exporter in the form of packing credit or post-shipment credit. Packing credit means any loan or advance granted or any other credit provided by an institution to an exporter for financing the purchase, processing or packing of goods on the basis of L/C. Post-shipment credit means any loan or advance granted or any other credit provided by an institution to an exporter of goods from Bangladesh from the date of extending the credit after shipment of the goods to the date of realization of the export proceeds and includes any loan or advance granted to an exporter, in consideration of, or on the security of, any duty drawback or any cash payment by way of incentive. 1. Procedure for Registration of Exporter. 2. Books and Register/Ledger required for export. 3. Export L/C Checking and Advising. 4. Formalities of Back to Back L/C opening. 5. Accounting of B/B L/C. 9. Export document checking and negotiation/negotiation under reserve/collection basis. 10. Calculation of offering sheet for fund disbursement system. 12. Formalities of back to back payment system. 13. Payment from Bai-Muajjal Inv. Bill A/c (if export fails). 14. Substitute benefit realization/collection system. 15. EXP form reporting to Bangladesh Bank. 16. Disposal of EXP forms. 18. Disputes and settlement of the export claim. Procedure for obtaining Export Registration Certificate (ERC). For obtaining the export registration certificate (ERC) from CCI & E, the following documents are required. 4) Memorandum & Articles of Association and Incorporation Certificate. 8) Copy of rent receipt of the business firm. 9) Fees paid through treasury challans. On receipt of Export L/C, it is to be recorded in the bank’s inward register and then the signature on the L/C or test number for telex L/C is to be verified by an authorized officer of a bank and finally it is to be forwarded to the beneficiary under forwarding schedule. 1. Full particulars of the bank account. 3. Statement of Assets & liabilities. 5. Valid Bonded Warehouse Licence. On receipt of the above documents and papers, the back to back L/C opening section will prepare a credit report. The branch must obtain sanction from the Head office for the opening of BB L/C. Exporters prepare the documents and submit the same to the bank for negotiation. 1. Bill of Exchange or Draft. a) L/C restricted or not. b) Exporter us to submit documents before the expiry date of the credit. c) Shortage of documents etc. a) Each and every document should be verified with the L/C. a) Verified one document to another. On receipt of documents it must be checked properly and then a proposal sheet would be prepared as per bank’s format indicating the full particulars of shipment and discrepancies under the signature of the authorized person and should be placed to the manager for disposal instruction or sanction. – Rubber stamp must be affixed on all the documents mentioning the FBN Number. – Endorse the draft, B/L, the Insurance policy in favour of the foreign correspondent as per L/C terms. – Prepare the forwarding schedule in five copies. i) 1st mail original documents under the original bank forwarding schedule by courier service. ii) 2nd mail Duplicate sheet of the document under the duplicate bank forwarding schedule by courier service as per L/C terms. iv) 4th copy is for record in the FBN file. v) 5th copy is used if necessary as a tracer or reminder. 2. Inspection of the goods from the competent authority as per L/C. 3. Prepared invoice and packing list and vessel booking particulars. 4. Papers to be sent to C&F agent for shipment. 5. C&F agent will do the customs formalities i.e. nation/entry. Checking the goods as per invoice & packing list inspection report etc. 6. C&F agent will take permission for shipment/hand over the goods to shipping co.
7. After completion of all customs formalities, the nominating shipping company. received the goods for sail/load in the ship and issued a receipt which is known as mates receipt. 8. C&F Agent hand over the shipping receipt to the exporter or they can take the original B/L in payment of freight and other expenditure etc. 9. Exporter may despatch the shipment advice to the importer directly as per L/C. 10. C&F Agent receives the original B/L from the relative shipping co. and despatches the same to the bank for negotiation or receives (the exporter) from the shipping co. directly. 11. Exporter submits the all original and duplicate sets of document to the bank for negotiation. 12. After negotiation bank should despatch the documents to the opening bank for deliver of the goods from the port. 13. Opening bank lodged the documents and make payment to the negotiation bank A/C as per L/C terms. 2. BAI Muazzal Investment (Forced Loan). Pre-shipment finance is an advance granted by a bank to an exporter to meet the cost upto the packing of goods for export to the overseas buyer. This is done in the pre-shipment stage. So it is also called pre-shipment advance. The purpose of the investment is for the purchase of raw materials for finished goods or manufacturing, processing, packing transporting up to warehousing/port of shipment etc. for export. Pre-shipment is an advance for procurement of finished goods. The party is to apply the bank. On receipt of the application for the pre-shipment facility, the section will start scrutiny of the application. – Types of pre-shipment: Whether clean/pledge/hypothecation of goods. – Whether the investment is within Bangladesh Bank credit restriction. – Whether the security offered is acceptable. – What is the purpose of the investment? – Whether the goods specified for finance is eligible for export under export control rule. – How the PSI A/C will be adjusted. – Whether the item is traditional or non-traditional. – Execution of the charge documents. – Lien Mark on the Master L/C. On receipt of the goods in the godown or warehouse banker should inspect the goods and process the proposal for making payment @ 9% on FOB value of Master L/C for 180 days. Cr. Income A/C (Estimated profit after the realization of the proceeds. 1. Bank finance at the rate of 75% of cost price. i) Party 60% But be ensured minimum R/R as prescribed by H.O. On completion of negotiation with the seller regarding price, quantity etc., the party will deposit their equity amount at the rate of 25% of the cost price to the bank with the request to make payment of the price to the seller. Disbursement of the amount by creating investment under the Head Musharaka pre-shipment (Quota) after verifying the market price and observing documentation formalities under Musharaka Agreement. Before disbursement, the Quota allocation duly transferred by Quota Holder and duly authenticated by Export Promotion Bureau in favour of the buyer will be placed under bank’s lien along with the party’s letter of undertaking to the effect that they will make necessary agreement for adjustment of the bank’s investment by export proceeds and in the event of their failure to make export they will pay back above special pre-shipment investment (Quota) from their other sources within the due date. iii) Additional charge to be created on the value of collateral security already held if covered by value thereof. If the value of Existing collateral security does not cover additional collateral security to be obtained. Charge to be created on the present and future assets of the company in bank’s favour with the registrar of joint stock companies against the liabilities of the party with the bank if not done earlier. At the time of allowing pre-shipment investment, if any, on arrival of the raw-materials proportionate amount of special pre-shipment investment (Quota) will be transferred to normal pre-shipment investment account. Pre-shipment finance for manufacturing the garments will be allowed to such extent as the total liability of an account of quota purchase, import payment, and normal pre-shipment together will not exceed 90 percent of FOB value of the Export L/C. At the close of individual i.e. on the negotiation of an export bill or receipt of export proceeds in case of the collection bill proportionate amount of Bank’s investment together with profit as per agreed ration will be recovered after obtaining a final account from the party. It is a Musharaka Investment which needs round the close supervision. Bank will exercise the utmost care to supervise utilization of the quota allocation as early as possible invariable within the quota year. Bank will participate in the party’s business negotiation both in respect of the import of the raw materials and the export of the ready-made garments. Bank will also inspect the party’s books of account in connection with the deals so as to ensure actualization of the estimated profit or maximization thereof. i) An unconditional and irrevocable undertaking to be obtained from the party to the effect that they shall arrange obtention of necessary export order through acceptable export L/C failing they shall arrange disposal of the quota under bank’s supervision and adjust the proceeds towards the financing to be allowed and in the even of shortfall, if any, the same shall be adjusted on or before due date(s) from party’s own sources. ii) The branch must verify market of the Quota & Quota be purchased at competitive price and market price verification certificate duly signed by Branch Incumbent/2nd Officer, Foreign Exchange In-charge & the Dealing Desk Officer should be retained for the record. iii) An affidavit in the appropriate manner is obtained from the party to the effect that entire quota presently held by the party & will be performed & be purchased in future irrespective of bank/own finance will be kept lien with the branch and will be utilized by exporting readymade garments through the branch. i) The bank may allow export credit to the extent of 90% of the value of confirmed irrevocable export L/C or firm sale contract. The guarantee covers 85% of loss caused by commercial risk and 95% of the loss caused by political risks. Estimated profit for 90 days must be calculated and marked in the Ledger. When deal will close in that time bank will realize the profit in full from their A/C.